Jury selection is set to begin in the case of a man accused of threatening court officials after having been convicted and sentenced to prison for threatening a state judge. Edward Taupier, of Cromwell, was charged last year with inciting injury to persons or property and threatening. Police said he created Facebook posts urging people to kill court employees and referenced officials at Middletown Superior Court. Jury selection is expected to begin Thursday in New London Superior Court. 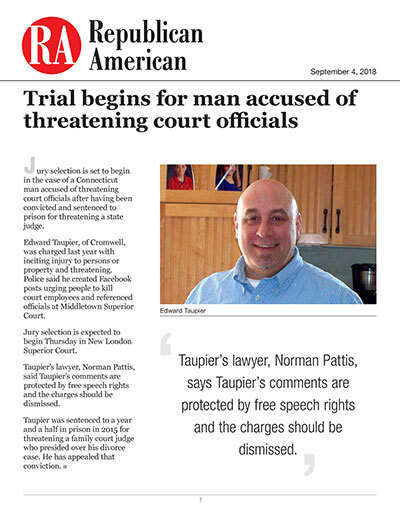 Taupier’s lawyer, Norman Pattis, said Taupier’s comments are protected by free speech rights and the charges should be dismissed. Taupier was sentenced to a year and a half in prison in 2015 for threatening a family court judge who presided over his divorce case. He has appealed that conviction.